This was a print of a somewhat abstract painting I did of a storm that was moving in. A bit of random rolling out of ink in the background for a slight ‘organic’ feel. The Luther Marsh is a large, man made lake that affords sanctuary for many, many birds, migratory and otherwise. Areas of it still have the trees that died when the area was flooded and some of these support nests like the Blue Heron nest in my print. After visiting the cheek to jowl State campgrounds in New York and Pennsylvania in August, it was a treat to canoe out into the peace and quiet of northern Georgian Bay’s archipelago. At some point in the past some really, really, strong individuals arranged a few really, really, massive stones into a fireplace complete with seating with, of course, a wonderful view. 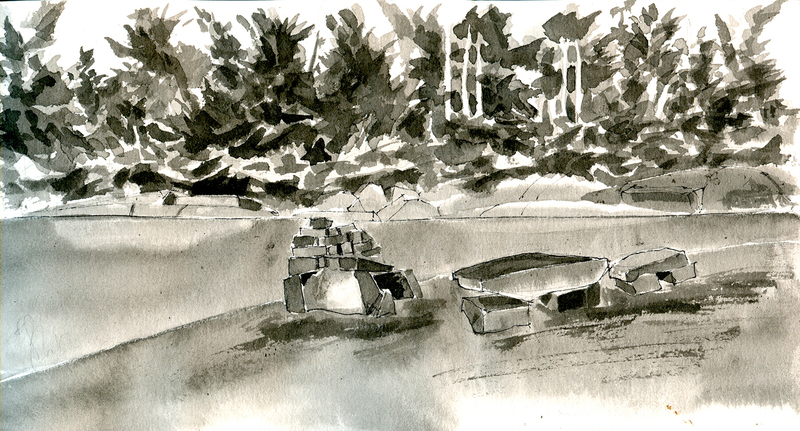 The sketch was an attempt to capture the tangle of trees on the opposite shore.